Step 1: Boil first 3 ingredients in a large stockpot until reduced to 4 cups, about 25 minutes. Preheat oven to 325° on Standard Bake. Step 2: Heat oil in large ovenproof stockpot over high heat. Add onions, celery, allspice, and season with salt. Sauté until onions are caramelized, stirring often, about 25 minutes. Add garlic and thyme. Add tomato paste. Transfer onion mixture to stockpot. Bring to a boil and scrape up browned bits. Transfer to large mixing bowl. Step 3: Season brisket generously with salt and pepper. Add to stockpot and brown over high heat, about 5 minutes per side. Place brisket fat side up and add in onion mixture. Bring to a boil and scrape up browned bits. Cover stockpot tightly and place in oven. Bake until brisket is tender, about 3 hours. Step 4: Transfer brisket to cutting board, scraping gelled juices off. Place stockpot on cooktop and bring contents to a simmer. Pour contents of roasting pan into strainer set over large bowl. Press on solids to release as much liquid as possible. Pulse solids in processor. Mix puree into juices to form a thick sauce. Add to medium saucepan. Season with salt & pepper. Step 5: Slice brisket thinly across grain and at a slight diagonal angle. Arrange slices in glass baking dish. Drizzle half of sauce over meat. Cover with foil. When any vegetables are done, arrange brisket on platter, arrange vegetables around brisket, serve with sauce. 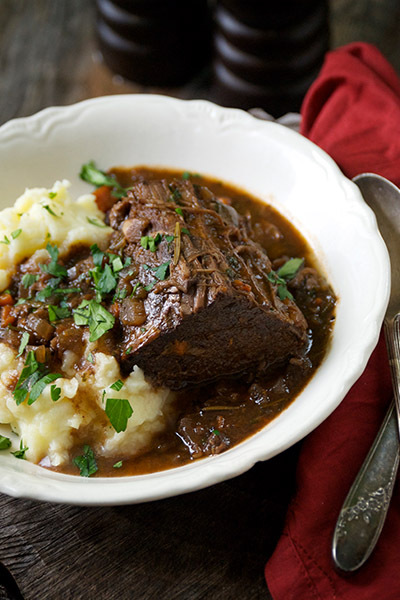 Enjoy this delicious brisket recipe from Dacor!